— dc Talk, "Day By Day"
Recently while sitting on a train, a largely unremarkable thing happened – so unremarkable it gave me pause for thought. What was this non-event? 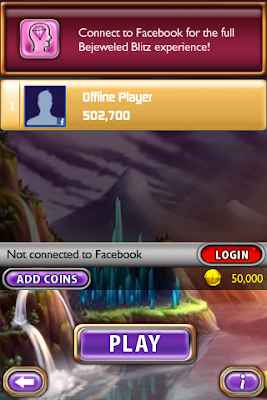 I got a new PB in Bejeweled Blitz. Not just any Personal Best: I cracked the half-million mark (and beat my previous best by over 150,000)! I enjoyed the quick squirt of adrenaline as it shot through my body, and then I thought: "Huh." Such constant "engagement" (from pellet-popping to drinking from the firehose) has made it very hard for my brain to either 1) switch off or 2) give undivided attention to just one thing. Sometimes this is a benefit, but mostly, it just leaves me distracted and not at rest. This spills out into all sorts of areas; why bother taking the time to cook a healthy meal when "fast food" slips into the cycle more easily? Or learning a new skill? Or making any time investment at all? But the place where rubber hits road for me the hardest is spending time with God — how can I be still when everything in my mind screams "hurry, hurry, faster, more!" How can I spend time meditating on a chunk of connected verses, when they seem to meld into a stream of 140-character morsels right before my eyes? Oh wow, this totally hit home with me. I can so relate! Being a Gen-Y tech/facebook junky frustrates me no end. The days of concentrating seem to have disappeared....but I'm determined to rediscover them somehow. I love your description of the one-step! Arthur: I love that picture - every time I come across it it hits home with new force, and it's a both/and scenario here in the West!